Kingdom Hearts III has been in development for a very long time but only recently we have started seeing more of the game in actions. During the recent D23 Expo Japan, Tetsuya Nomura and his team have talked more about the game, the current state of development and more. The Kingdom Hearts Fan Event at the D23 Expo Japan this year hasn’t been streamed, but many have shared reports from the event. All these reports have been gathered together and translated by KH13. 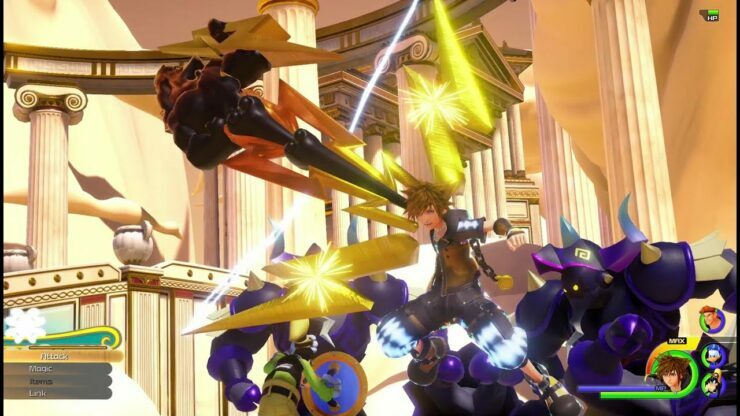 Following the showing of the Kingdom Hearts III trailer featuring the Monsters, Inc. world, Tetsuya Nomura and his team confirmed that things will look even better in the final release, as everything is still in the works. More of the Tangled world has also been shown, with the team detailing how facial expressions are being developed and how everything will be more dynamic than ever, revealing how Rapunzel’s hair will move with the wind. During the discussion, Tetsuya Nomura and his team touched upon the current state of development. The ten worlds and other things that are in the works for Kingdom Hearts III are divided into three major areas. The first one is around 90% done, the second 60 to 70% done. It’s also been confirmed that the Kingdom Hearts III development team is the largest at Square Enix at the moment, with some parts of development being outsourced. The background, among the ten* worlds and other things that were being worked on, are divided into three major areas: the beginning locations, mid-level locations, and the final locations. In the beginning locations, Monsters, Inc. and Toy Story are included, and are about 90% completed. Mid-level locations, including Tangled, are about 60 to 70% finished. The background team is probably the largest in Square Enix, and, in addition to the Osaka and Tokyo teams, there are orders being carried out by outsourced foreign company employees. Despite being close to the end of development, there still things that are getting added to the game, so Kingdom Hearts III is still in full development. With such a big scope, everything in Kingdom Hearts III is a league of its own, and there are still many surprises that have yet to be revealed. Kingdom Hearts III is in development for PlayStation 4 and Xbox One.